When it’s time to decorate small studio apartment spaces, the challenge is to make the most of your square footage, yet still find room to express your style. Through careful selection of studio apartment furniture, along with creative arrangement, small spaces can be much more than just livable – they can be delightful! To decorate studio apartment space so it looks bigger, make sure to use the right scale of furniture. That means neither too big, which would simply take too much of the space, nor too small, which would often makes the space look cluttered. 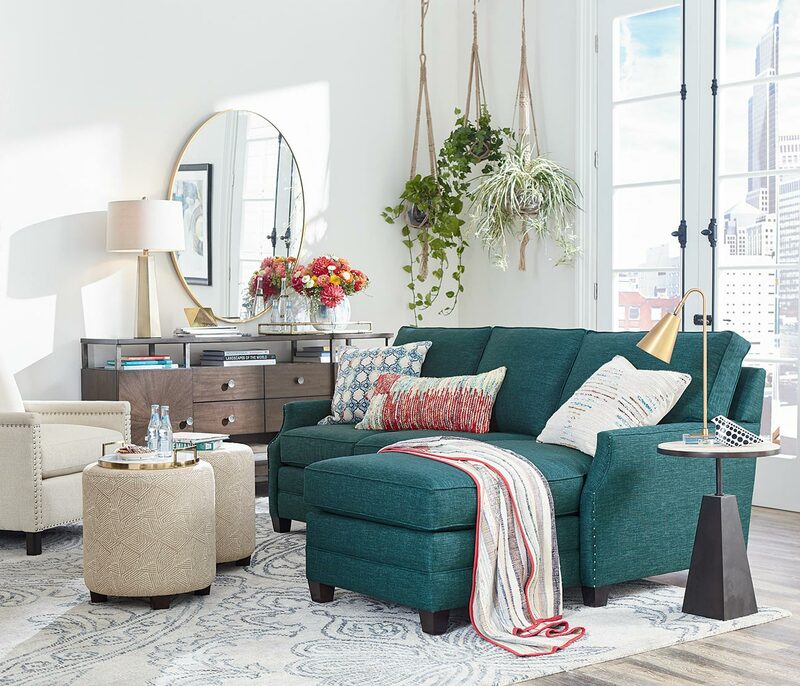 A sprawling sectional would be too much, but a sofa or sectional sized just right for studio spaces, like Bassett’s Studio Loft Collection, can actually make the space appear roomier. A Mid century modern style furniture often works well because it is low slung, and features spindly legs, and both of those features enhance the feeling of space. Round dining tables and curvy chairs with spindly legs also work well. Select pieces carefully, and edit fiercely. Another key to making a studio space look bigger is mirrors! Use them to increase light, add an extra window, or enhance the sense of space. Placing a mirror opposite a window doubles your view. And surprisingly, a large floor mirror can be particularly effective in a small space. A large rug under the bed and another rug centered in the “living room” helps define each area. Room dividers like curtains, a folding screen, or better yet, a multi-functional bookcase provide visual separation. A storage ottoman functions as a foot rest, a storage space, or occasionally a table with the help of a tray. Tuck one or two ottomans under a console and – voila! Extra guest seating. Choose a desk that can double as a dining table. Use a fun credenza like Bassett's Soho Credenzas as a dresser! Placed behind the sofa, your credenza can even provide space for a bar tray when you entertain. Place a wall shelf next to the front door or above the sofa to take full advantage of vertical space. When you decorate a small studio apartment, storage pieces provide the key to hiding clutter. Look for flexible furniture of lasting quality. That way, if you ever decide to spread out into a larger space, you will have something besides a suitcase to bring with you – something that doesn’t feel like it still belongs back in your old place. When you want to style decorate a studio apartment, every piece counts. 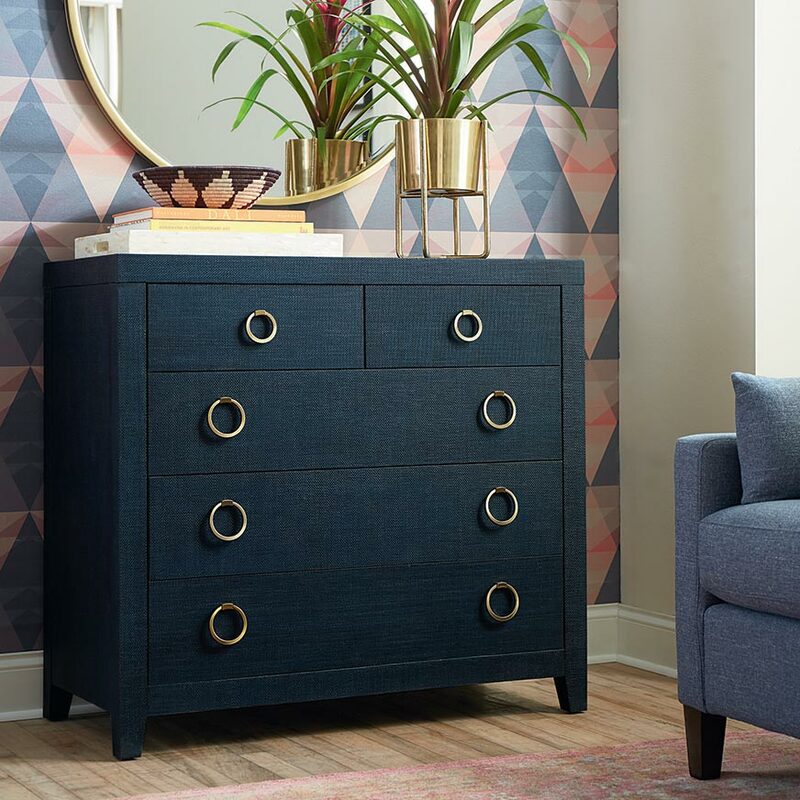 Bassett Furniture design consultants can furnish studio apartment ideas that make the most of your space, so schedule an appointment today and get ready to start living large. Or shop the Bassett Furniture collection for highly functional furniture of lasting quality.